This year’s been a tough one for environmental justice. Consider the Standing Rock Sioux Tribe and their allies, who ended 2016 on a high note when the Army Corps of Engineers rejected the Dakota Access Pipeline. Then, President Donald Trump happened. Within four days of his inauguration in January, he was signing presidential memoranda to push through the DAPL and the Keystone XL Pipeline. Here are some of the year’s environmental justice wins. 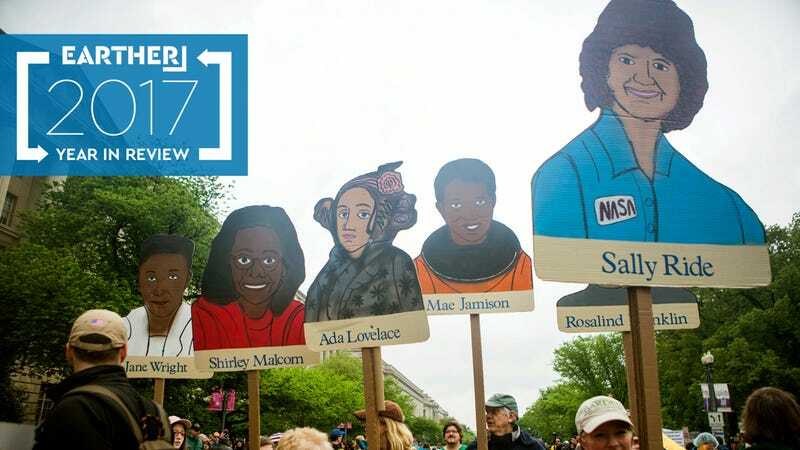 The March for Science, which took place back in April, caused quite a bit of controversy throughout its planning process, especially in how it dealt with race and gender. Some in the field don’t think scientists should get mixed up in the drama of politics. But not all scientists feel they have a choice, especially those who are not white or male (or either). March organizers, at first, were all for supporting marginalized people, but as soon as a scientist challenged that philosophy, the organization took down a tweet that conveyed a supportive message, in what was just the beginning of a months-long controversy. However, this resulted in some successes. In March, about a month before the event, organizers added two women of color as national co-chairs. Both were, of course, respected scientists: Dr. Mona Hanna-Attisha, the pediatrician who helped expose the water crisis in Flint, Michigan, and Dr. Lydia Villa-Komaroff, a molecular and cellular biologist. While the March for Science has continued to struggle with diversity issues since its April event, this was a step in the right direction. So was the growth of 500 Women Scientists, another grassroots effort that sprung out of a desire for more inclusivity in science. And whatever winds up happening with the March, the fact that it sparked a national conversation about race in science is important. Whenever science recognizes the need for more diversity, that’s a win in my book. Make no mistake: The fact that people in Flint, Michigan, still can’t drink their water shouldn’t be considered a win. The ongoing water crisis in Flint resulting from lead contamination is heartbreaking, especially when you take a look at how families have to spend the holidays. All I’m saying is, you gotta’ find some light in the darkness. And Flint has seen some progress this year. For one, the Environmental Protection Agency awarded the city a $100 million grant in March to help it rebuild its water infrastructure. Now, that process hasn’t left resident without any qualms, but the city is on its way to meeting its goal of replacing 18,000 lead service lines by 2020. In theory, no more lead pipes should mean no more lead-tainted water. Getting the community to drink tap water again, though, is going to take much more than that. Maybe the city can prioritize some trust building come 2018. Meet the so-called climate kids. These 21 young people—who range from 10 to 21—are challenging the federal government in the district court for the action (or lack of it) on climate change. They’re arguing that the government’s failure to properly act on the global crisis is threatening their right to life, liberty, and property. Trial was originally scheduled to begin in February. That’ll likely get pushed a bit as the parties wait for the judges to issue their formal decision. Right now, though, the case looks like it’ll get there. Watch out, Trump. These kids are on a mission. The U.S. federal government isn’t all that interested in renewable energy these days, but that’s why we have the rest of the world. Other nations can be the leaders, and the United States can watch opportunities slip by. So let’s look to Mexico and Costa Rica. They lit the path for renewables this year. Costa Rica’s electricity ran entirely on renewable energy for at least 300 days this year. The country announced this milestone back in November, so that number is probably higher by now. About 79 percent of the clean energy came from hydropower, and about 10 percent from wind. The sun-lit Central American country generated very little from solar, but that’s where Mexico killed it. This year, it sold the cheapest solar project—ever. An auction back in November resulted in a project that’d produce electricity for $17.70 per megawatt hour. During that same auction, another 15 bids went down, and the average price for the projects amounted to $20.57 per megawatt hour. This is cheap as hell for solar power. This move toward renewables is not only good for the planet; it’s good for our economy. China and India, two of the world’s worst polluters right now, are on track to “overachieve” their goals set forth in the Paris Agreement, according to a Climate Action Tracker study released in May. Yaaaas! Of the world’s three top emitters—the U.S., China, and India—the U.S. is the only one steering completely off track to meet these targets. I mean, Trump is withdrawing us from the Paris Agreement completely attempting to dismember the Clean Power Plan bit by bit, so no surprise. The good news is that with China and India severely cutting their carbon emissions, emissions worldwide should fall, too. And that’s thanks to their shift toward renewables and away from coal. Meanwhile, in the United States, the Trump administration wants to go back to the days of when coal hailed (and killed). Sigh. From banks to international institutions to entire cities, 2017 was the year of fossil fuel divestment. Maybe they finally realized their money would be better spent elsewhere? Or maybe they simply didn’t want their money going toward Big Oil anymore. In any case, the year started with the Seattle City Council unanimously voting to end its relationship with Wells Fargo because of its financing of the Dakota Access Pipeline. Then came Davis, California. It’s opting to go with a new bank or credit union instead. Cities aren’t alone, though. A Norwegian investment group, Storebrand, which manages the pensions of 1.2 million Norwegians, announced in March that it had sold all its shares in the companies behind the Dakota Access Pipeline. This included Phillips 66, Marathon Petroleum Corporation, and Enbridge. Then, in November, the pension fund decided to drop 10 coal companies from its $80 billion portfolio. Take that, climate change. The World Bank announced in December that it will end its financial support of oil and gas projects come 2019. While none of these moves in themselves will have a major impact on these companies’ bottom lines, but they send a clear message: Fossil fuels don’t make sense in the long term. Here’s a key fact about tribal nations people often forget: They’re sovereign, and federal governments (like the U.S. and Canada) have signed treaties with them. Y’know, treaties like countries sign with each other. And these documents carry legal merit. Tribes have won environmental cases in the United States based on treaties, and the same happened in Canada this year. In December, the Supreme Court in Canada ruled in favor of the Yukon First Nations in a five-year legal battle to protect the Peel watershed, nearly 68,000 acres of pristine land. Back in 2011, an independent commission was all like, “Let’s protect, oh, about 80 percent of this land from development.” But the territory’s governments didn’t approve. It wanted to protect just 30 percent of the land, so it went ahead and created its own land use plan. Long story short, that move was illegal because of the Yukon’s Umbrella Final Agreement, a treaty signed in 1990. It requires the government consult with tribes on such decisions. So this Supreme Court decision doesn’t mean that the government must use the plan the commission laid out in 2011. Rather, it brings the parties back to that point in the land-use planning. Now, the government has to work through the process. That means tribal consultation and actually listening to what the First Nations have to say. The government may go ahead and reject that plan, anyway, but at least relevant stakeholders can give it a piece of their mind first. The year 2017 began with a dark cloud over our heads. The remarkable fight for indigenous rights at Standing Rock came to an immediate halt with Trump in the White House. Except, not really. Maybe federal support was gone, but now the Standing Rock Sioux Tribe is trying to make its case in court. And that’s not over. In fact, this year, the lawsuit has seen some incredible advances that spark hope—even if that damn pipeline is now up and running. Then, just earlier this month, the court decided pipeline developer Energy Transfer Partners must come up with an oil spill response plan. The Keystone Pipeline (not to be confused with the Keystone XL) saw a major oil spill in November, and the court acknowledged that. Now, the court wants to see Energy Transfer Partners be prepared for anything similar and file regular reports on any incidents or pipeline repairs. That lawsuit is ongoing, too, so you never know. It could lead to some more success stories next year.